Sensei Bateman’s History in Martial Arts. He first started training in 1985 in a system of karate called Anshin Ryu. His instructors were Keith Bell 4th Dan and Garry Howlett 3rd Dan. The Anshin Ryu system is a hybrid of Shotokan and Wado Ryu. 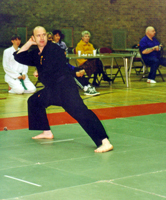 Back in 1992, he joined UKASKO and set up his own dojo, along with my wife and son, here in Darlington. During this time he studied Shotokan further, especially in Kata, and it’s applications (Bunkai), under Sensei Terry Mathur, 5th Dan. Sensei Bateman became interested in weapons and found an instructor named Sensei O’Connor down in Essex to teach him. Then in 1998 he got the opportunity to travel to Okinawa, Naha, to train under Kaicho Takashi Kinjo (9th Dan) and Mikio Nishiuchi (7th Dan). This was mainly in a style similar to the current Matayoshi Kobujutsu. It was in Okinawa that he was graded to 2nd Dan in the Kobujutsu system. He was also exposed to a style of Karate called Pangai-noon-ryu (also known as Uechi-ryu). His experience in Okinawa had a caused him to look for a style of karate back in England that was not sport orientated, but related to pure Bujutsu. His searches lead him to his current karate Sensei in Phil Snewin (5th Dan) studying Kamishin Ryu Karate-do since 1998. He now runs a school in this system here in Darlington. Other martial arts he has studied have been in Aikido (2 years), Ninjutsu (4 years in Togakure Ninjutsu Ryu, under Shihan Brian McCarthy) and Iaido (Muso Jikiden Eishin Ryu, graded to 1st Kyu in the system). 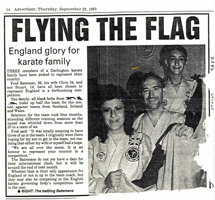 He has competed for UKASKO’s international English Kata squad, and became UKASKO’s Chief Referee, after qualifying as an English Karate Governing Body (now Karate England) Kumite and Kata Referee. He is also one of UKASKO Dan grading officers. It was in April 2018 that UKASKO awarded Sensei Bateman a 6th Dan Black Belt in Anshin Karate. He has now recently associated his Kobudo School to the Kodokan in Japan, under the guidance of Sensei Sanguinetti 7th Dan. 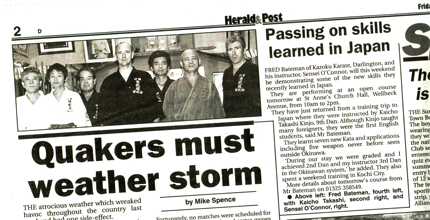 Now he and his students are learning Matayoshi Kobudo as recognised by the Kodokan in Okinawa. It was during 2008 Gasshuku that Sensei Sanguinetti awarded him a Shodan in the system. Sensei Bateman now instructs regular classes in Anshin Ryu & Kamishin Ryu Karate; Matayoshi Kobujutsu. He also teaches Hanbo & Shuchu techniques (walking stick & small hand stick), and monthly classes in Iaido/Bokken (sword drawing & wooden sword). 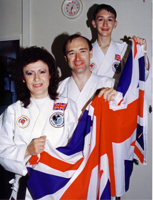 Three members of a Darlington karate family have been picked to represent their country. Fred Bateman, 36, his wife Chris 34, and son Stuart, 14, have all been chosen to represent England in a forthcoming competition. The family, all black belts make up half the team for the contest against Scotland, Ireland and Wales. Selection for the team took four months, attending different training sessions as the squad was whittled down from more than 50 to a team of six. Fred said: “It was totally amazing to have three of us in the team. I originally went there hoping for my son to get in the team, not realising that either my wife or myself had a hope. We are all over the moon. It is an honour to represent your country in a competition”. Fred Bateman of Kazoku Karate, Darlington, and his instructor, Sensei O’Connor, will this weekend be demonstrating some of the new skills they recently learned from Japan. They are performing at an open course tomorrow at St Anne’s Church Hall, Welbeck Avenue from 10 am to 2 pm. They have just returned from a training trip to Japan where they were instructed by Kaicho Takashi Kinjo 9th Dan. “Although Kinjo taught many foreigners, they were the first English students”, said Mr Bateman. During our stay we were graded and I achieved 2nd Dan and my instructor 3rd Dan in the Okinawan system”, he added.